Food-related diseases affect tens of millions of people and kill thousands each year. A foodborne illness is caused by eating or drinking a contaminated food or beverage. 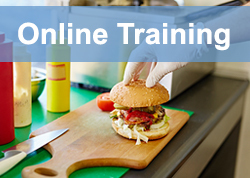 NEHA’s food safety programs are dedicated to educating food safety and environmental health professionals. NEHA helps to inform, educate and improve preparedness, response, and prevention of foodborne diseases within both the regulatory and industry workforce. The food safety products and materials we offer can be used for someone just beginning their career in the food industry, or a professional with many years of experience. Stay up-to-date on the latest trends related to the emerging topic of cannabis and food safety. Environmental Health professionals ensure our food is safe by educating, inspecting, and investigating facilities throughout the food supply chain, including farms and manufacturers, restaurants, and grocery stores. The Council to Improve Foodborne Outbreak Response (CIFOR) has the Guidelines for Foodborne Disease Outbreak Response and CIFOR Industry Guidelines (for Owners, Operators, and Managers of Food Establishments) available for download.